Working with or near chemicals can be immensely dangerous. Chemical hazard signs are designed to alert those in your workplace of a physical or health hazard. These safety signs help remind workers of proper handling procedures. If workers are warned early and clearly enough of a specific hazard then the required precautions can be taken. 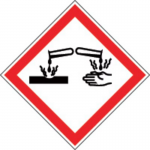 OSE Directory showcases a large selection of chemical warning signs to keep you safe.